Today I have one very exciting conversation: Lara Watson, the editor of Mollie Makes. When and how did you start in the magazine business? I graduated with an English degree and a post-grad in magazine journalism and my first job was coordinating editorial on a trio of little local food magazines. 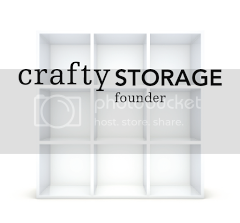 I worked there for over 3 years before moving on to a new craft mag at Future Publishing called You Can Craft. I was production editor there – which in this case meant I was in charge of the words, scheduling, news sourcing and online work. It closed after a year and I worked on a family history title for a little while before hearing colleagues chat about a new launch in the works called Mollie Makes. I offered to write for them in a freelance capacity and was asked to join the team as Creative Editor, where I compiled news pages and looked after social media. My Deputy Editor and Editor moved on to other projects in quite quick succession so I climbed the ladder pretty quickly, which is unusual! You are currently the Mollie Makes editor, What responsibilities do you have as such? It’s my job to lead and manage the editorial team, plan content, watch trends and the industry. I liaise with other internal departments such as marketing and advertising, make sure everyone gets paid and has the right contract. 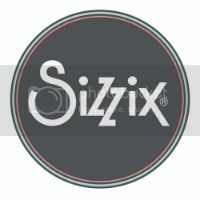 I commission, advise, proof pages, sign things off and keep an eye on or organise all brand extension work such as our events, our book series and more. I do lots of networking! There’s nothing I enjoy more than putting creative people in touch with each other and seeing how ideas can get better and better with collaboration and support. Our Mollie Makes Handmade Awards day is an annual highlight of this job for me. 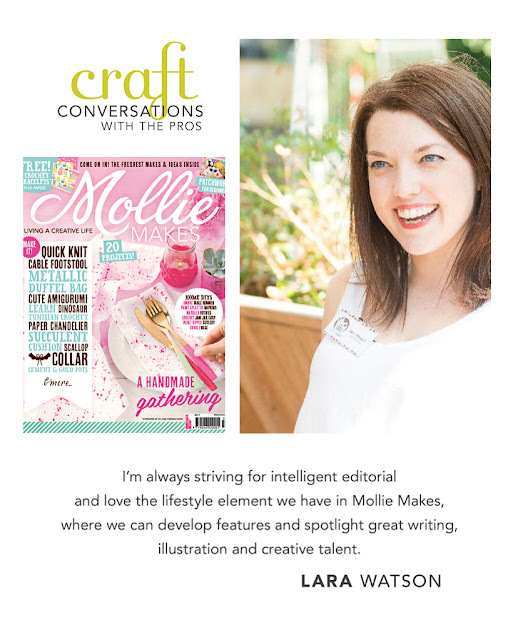 I’m also always striving for intelligent editorial and love the lifestyle element we have in Mollie Makes, where we can develop features and spotlight great writing, illustration and creative talent, not just step-by-step craft projects. 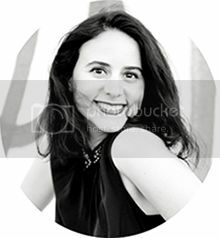 Being shortlisted for Editor of the Year at the PPA New Talent Awards and Rising Star at the British Media Awards in 2014. Is it hard to work full/part time in the magazine industry? Can you name your major challenges you face working in the craft magazine world? The biggest challenge is resource and time. There’s so much we want to do on our small team but there simply isn’t room for everything when you’re filling at least 108 pages from scratch every 20 days, running a world-class social media brand and writing a blog. And the rest! Editors these days have to be multi-skilled and willing to turn their hands to everything: marketing, writing, styling, event organising, presenting, video-making and shop-curating... 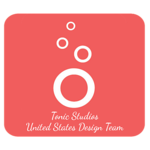 The list goes on with each new development in our changing media environment. What was traditionally a print-based job is very different now. What do you think is more important to succeed in this craft industry: creative talent, hard work or luck? Truthfully it’s a bit of everything. I'd say talent is the most important – it’s how you first get noticed. Luck plays a part as so much of this industry can come down to whether you’re in the right place at the right time, connecting with the right people. And it’s never been easier to reach out to the people that make decisions now we have Twitter etc! Hard work keeps you relevant and fresh, and means you’re likely to be invited back. I don’t believe in regrets. Every job I’ve had has pushed me on in a positive way depending on what I needed at the time. Whenever I've ended up not enjoying a role, it’s taught me a good lesson about myself. It’s meant I’ve looked around for the next, better thing. Joining Mollie came at a time when I really wanted to focus on my career so I was able to throw myself in completely. At any other time it may have been overwhelming! I think you get to know what kind of work suits you over the years. What do you look for in submissions for Mollie Makes? Really I’m looking for something a bit different with a level of neatness, professionalism and consideration. A slightly different or unusual angle will always make me sit up and take another look. I like to see that people who pitch to me have read our magazine and understand our aesthetic. 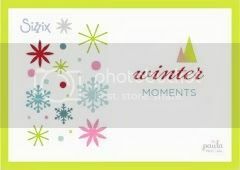 Good photography and presentation is increasingly important. 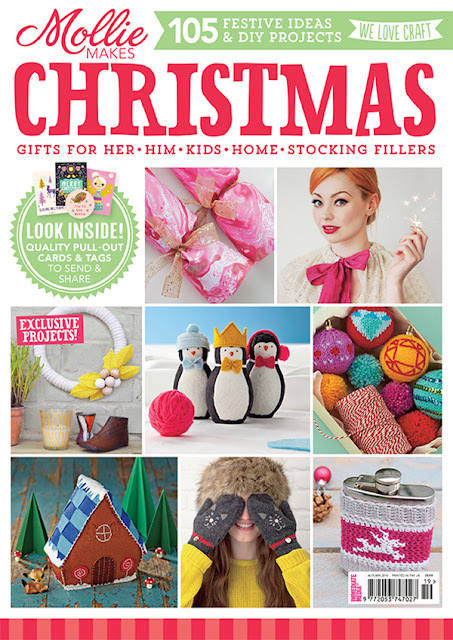 Any top tips when working with craft magazines? It’s a collaboration rather than a transaction. Working together, reading a brief thoroughly and discussing and sharing ideas is key. Keep to your deadlines (or ask for an extension if you need one!) and be friendly. 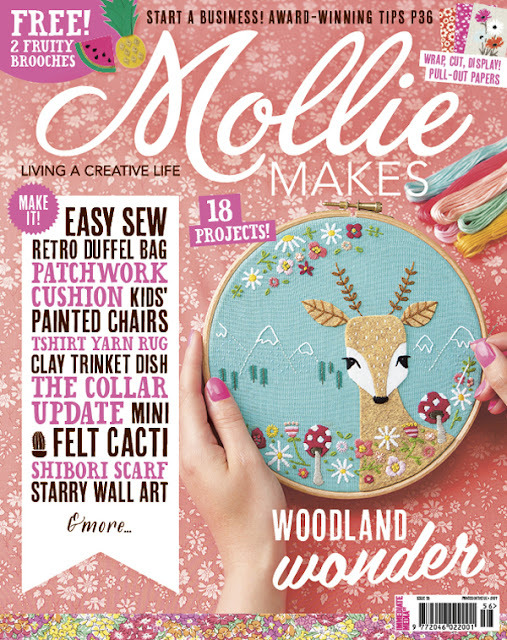 What is your favourite type of project to feature in Mollie Makes? I’m a big crochet fan but my first creative love is papercraft so a fresh idea with pretty papers and washi tape is right up my street! I have a weak spot for stationery. Good photography and styling makes me very happy! Our art editor, Helena Tracey, is a star. 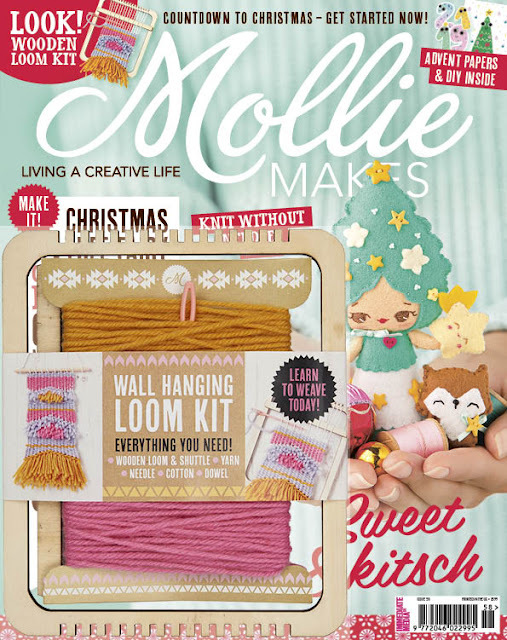 What do you think it appeals more to the Mollie Makes crowd: quick and easy; useful or really pretty projects? We have such a wide range of readers that I try to include something for everyone. We like to always include a more time-consuming project for people who like to have a work-in-progress on the go at all times. Quick and easy is always a winner – everyone loves that feeling of completing something in an afternoon! Again, a mixture of decorative and useful is important for any craft magazine. Let’s say Mollie readers aren’t adverse to something as frivolous and fun as a crochet apple cosy. What is your favourite colour in general? And to feature projects for the magazine? I love mustard yellow, bright cerise red, duck egg blue and neutrals paired with neon yellow. Eclectic! To wear, I prefer black, navy, beige, copper or metallics with a little hint of pattern at the moment. 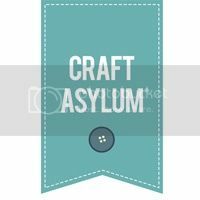 As a crafter yourself, what is your style, technique, project wise? 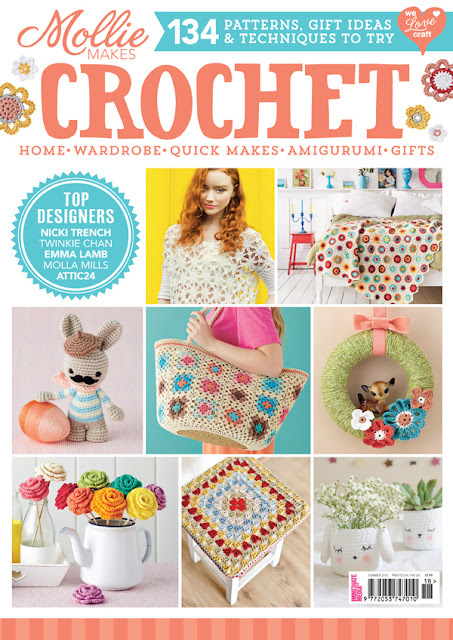 My main projects are crochet granny square blankets, scrapbooks and greetings cards. I like having a crochet blanket on the go all the time to give as a gift. I travel so much that it’s handy to carry around with me on the tube etc. Instagram and Pinterest of course! I follow a lot of great craft companies on Facebook too and am always screen grabbing interesting stories or images. Otherwise, it’s just watching people, having a look in interiors and fashion shops, flicking through magazines. I like noticing what people are pinning, wearing and photographing. I love a good film, art exhibition or museum. We’re working on our latest special – a colouring-in book with a Mollie twist, which is very exciting. We’re also looking at e-commerce and the wider brand. I'd like to do more video, events and classes. You can read more Craft Conversations with the Pros here.